MDTA offers different options for online training, as our system of personal protection and self preservation techniques are in high demand. As not everyone has access to, or can attend MDTA locations. We now offer "Online Training Courses & Programs." The following are our online training options. Karl Thornton - Principal Instructor. "I understand the need for physical training. These video tutorials are for information purposes, and will require the participant to find a training partner to learn the physical aspects". MDTA realise that there is a need for the MDTA Reality Based Self Defence system to be available to those who cannot attend for whatever reason. All MDTA techniques are provided online, as well as all information in relation to the dynamics and applications. This is an online environment with access for direct correspondence and contact with Karl Thornton. Situational Awareness training is taught to individuals that deal with behaviours of concern, in environments of low, medium to high risk. Having trained situational awareness can give you an edge, an edge to identify behaviours of concern and avoid physical confrontations. 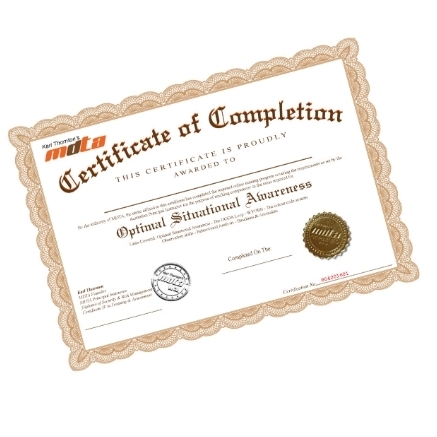 Once completed and passed as competent, you will receive a PDF Certificate of Completion by email. For Corporate Packages Click Here. This course is based on Karl Thornton's first published book on the topic of violence, and the evolution of violence. A factual look at the realities of violence, from a man who has been there, done that. This course contains factual information through Karls’ education, knowledge and experiences as a street thug as a teenager, to defender of trafficked children today. As well as his time as a security officer, bouncer, bodyguard, then his journey to where he is now. Training Corporations and the general public in the realities of violence and self-defence. An in-depth look at what Karl calls the 5-Fundamentals of Survival, the 20/20/60 Survival Ratio, as well as other violence related subjects. Karl Thornton - Principal Instructor. "I understand the need for different training drills (Pad Drills) to keep training interesting while building on technique and hitting hard. What we call power striking. These online drills are for instructors of ANY club or organisation to use in their training environments, and are delivered to give options and variation in training sessions." MDTA specialise in Reality Based Self Defence and all drills are based on gross motor striking and power delivery when applying it to the flow and rotation of aggression and violence. All these MDTA drills are provided online in a special log in area of the MDTA site.